to protect your account and adjust your security settings, and learn more about other ways to keep your Google Account secure at privacy.google.com. But this Safer Internet Day, we wanted to give some insight into how our systems protect you automatically - on Google and beyond. No switches to flip or buttons to click, just the stuff that happens in the background that keeps you protected around the clock while you go about your day. 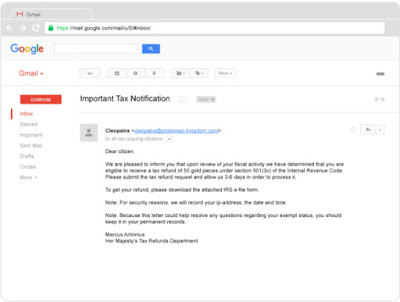 An email may look like it came from someone trustworthy, but it might be a wolf in sheep’s clothing. This spammy message is trying to phish you—trick you into giving away your personal information—and then give its authors access to your account. 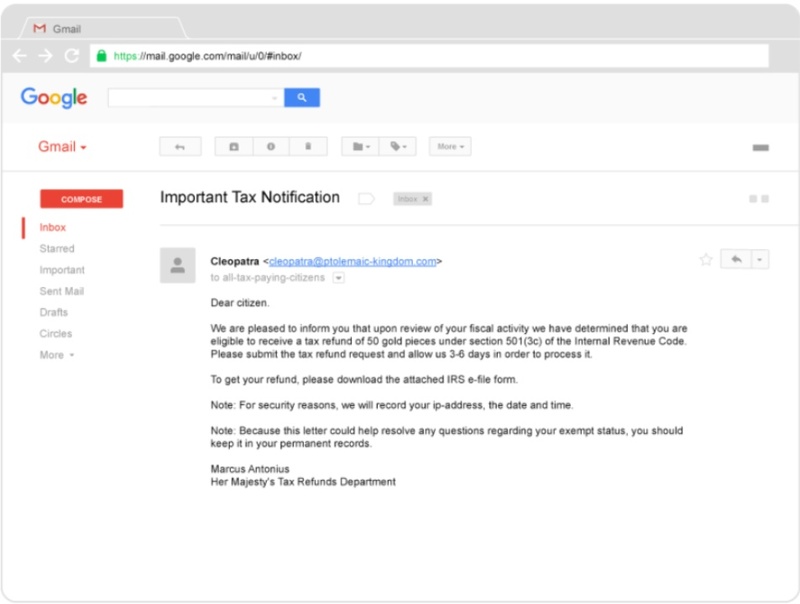 Luckily, we’ve built lots of smart armour into Gmail that helps to block dodgy messages before you ever see them. Our systems anonymously examine thousands of signals on Gmail - where a message originated, to whom it’s addressed, what’s contained in the message, how often the sender has contacted the recipient in the past - to determine which messages are safe, and which ones aren’t. We then filter the vast majority of this nasty stuff out; the average Gmail inbox contains less than 0.1 percent spam. Even that’s not enough, though, because the bad guys can be pretty clever. For example, a fraudster could steal your username and password because you accidentally shared them on an especially deceptive scam site. But even if attackers have your credentials, our systems are still able to block them and keep your account safe - something we did hundreds of millions of times in 2016. That's because we aren’t just making sure you’ve typed the right password. We also look for subtler signals to confirm the sign-in is you and not someone else: Are you using the same device that you usually use? Are you in a familiar location, or somewhere far away that you haven’t been to before? Scammers leave behind a trail of clues that help us inspect each log-in attempt and compare it with the picture of a safe log-in that our systems have painted based on billions and billions of other log-ins. If something looks fishy, we’ll require more verifications designed to thwart bad guys, send notifications to your phone, or email you so you can quickly act on anything that looks unfamiliar. We use similar security tools to help make the web and a huge variety of Android apps and devices safer, too. For example, have you ever clicked a link and seen a red warning, like this one below? A Safe Browsing warning: red means stop! That’s Safe Browsing at work, strongly suggesting you should avoid visiting a site because it probably contains “badness,” like malware or a phishing trap. 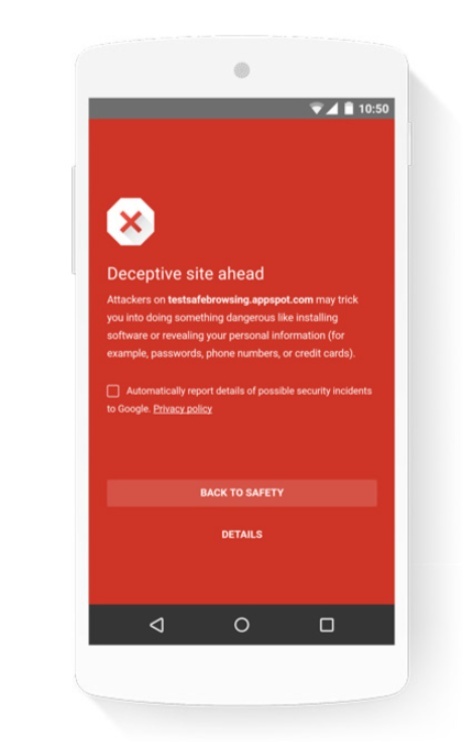 Similar to the way we crawl the web to deliver search results, Safe Browsing crawls for bad stuff that might be harmful to you or your device. It’s always hard at work: We show tens of millions of Safe Browsing warnings every week on more than 2 billion devices, across a variety of web browsers. For our Android users, we developed an “app analyzer” that builds on Safe Browsing’s technology to specifically hunt for dangerous Android apps, wherever they may be, and warn you before you install one. If an app doesn’t pass the app analyzer test, it’s not be allowed in Google Play. Detecting the obvious badness — sites well-known for phishing scams, ransomware that locks your device until you pay a fraudster — is relatively easy. But the stealthier badness is only detectable by measuring billions of signals across sites and apps. If this sounds similar to the way we approach spam protections on Gmail or suspicious logins into Google, that’s because it is! The ability to understand badness on a large scale enables us to find the clues bad guys didn’t even know they were leaving behind. We have a responsibility to keep you safe on Google, and help make the web more secure as well. We’re constantly improving our automatic protections, but we want to give you the controls to adjust your security settings as well. We helped Generation Next reach new audiences both within Australia and internationally through the launch of a YouTube channel highlighting content from their acclaimed national seminar series. Topics include understanding anxiety in young people, the best child safety curriculum, and cultivating strong self esteem in children. The Alannah and Madeline Foundation launched their eSmart Digital Licence with support from Google; teaching children aged 10-13 about how to use digital devices safely, social networking and gaming, protecting privacy, communicating safely online, searching and researching, friends and strangers, creating and sharing, and managing money and online credits. ReachOut launched a new online resource for parents and carers of teenagers which assists them in having difficult conversations about issues such as peer pressure and bullying. We’re also collaborating with Project Rockit on an exciting new project, stay tuned for more! If you need a refresher on the broader range of tools that Google makes available within our products to experience the Internet safely, take a look around the Google Safety Centre. Don't forget to take our Security Checkup and learn more about other ways to keep your Google Account secure at privacy.google.com, and happy Safer Internet Day! There are plenty of things we can all do to be safer and more secure online. Having a strong and unique password on different accounts is a good start - who hasn’t recycled the same combination of your pet’s name and the numbers ‘1-2-3’? We’ve all been guilty of that at one stage or another. Other measures include exchanging personal information only on encrypted sites, and keeping your software up to date with the latest patches - these tried-and-true tips have never been more important and effective. Take our two-minute Security Checkup to protect your account and adjust your security settings, and learn more about other ways to keep your Google Account secure at privacy.google.com.